Cemeteries intrigue me. I am not morbid, nor am I obsessed with thoughts or worries about my death, although I’m well aware I’m a lot closer to it than I was sixty years ago. But as much as I think of them as a quiet place for solitude and introspection, I think many others think of them as macabre. Am I just weird? Actually, they’re so full of history. Why would anyone not want to visit the final resting place of those who no longer belong to our world, whether or not we ever knew them? Think of it this way: through our visits they can briefly reclaim their lives in a sense–at least for as long as it takes us to read the words imprinted on their headstones. 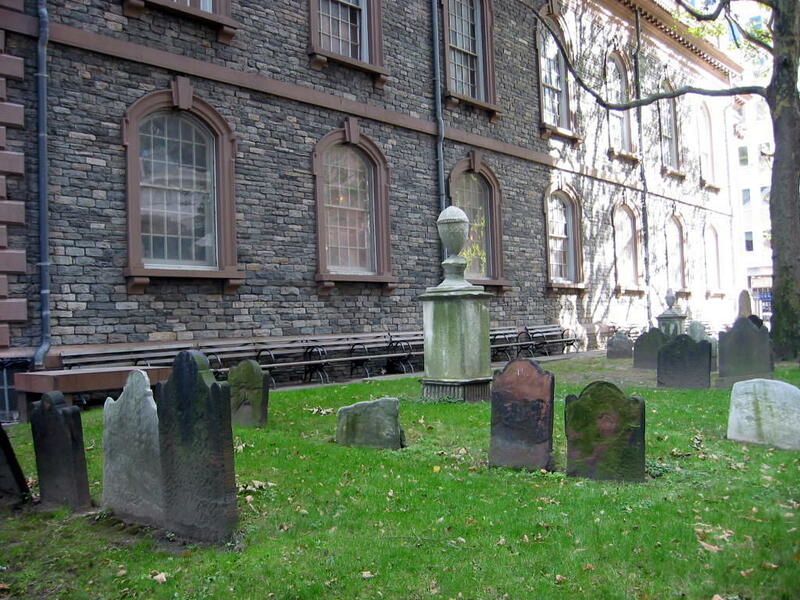 The scenes showcased here are of the cemetery at St. Paul’s Chapel–located across the street from the New York World Trade Center Site, by the way–where we visited last fall. My family is aware of my oddness and they accommodate my weird tastes as well as they can. Worthy of note is that St. Paul’s (below) is distinguished as being the oldest public building in Manhattan in continuous use since it was erected in 1766. It was also witness to the great NYC fire of 1776, and hosted George Washington on the day of his inauguration day in 1789. I learned that both rich and poor lie together here. Anglo-Saxon names predominate though there is a variety of nationality–Scotch, French, Dutch, German, Welsh, Swede, Hebrew and West Indian. It’s rare to find an octogenarian; Women died early, and most wives recorded as under 30. One man lost two wives, both young, within three years. Deaths of children seem common, many of them lost in infancy. A single tombstone records seven deaths under one year. Imagine the tears shed over those graves. This inscription on a tomb erected by Henry George in 1808, in memory of Catherine Owens, “his intended bosom companion” who died aged 24. Could that Henry George be an ancestor of Henry George who authored POVERTY AND PROGRESS in the late 1879? A French inscription on a tomb covering the remains of Moise Mendes Seixas, state that he “deced 6 11 Juillet, 1817, aged 66 and 8 mois set, 15 jours.” According to St. Paul historical records, he was evidently a descent of Gershom Seixas, an early Jewish Rabbi in New York, but there is no explanation of how he came to be buried among Christians. I could have spent the whole day right there, I think, but there just wasn’t enough time. Ironic isn’t it–that all those interred in the cemetery probably said that many times in their lifetimes? Now they have all the time in the world. So I took as many pictures as I could before we had to move on. Just a few days ago, Hubby asked me at breakfast (I have no idea what brought the subject to his mind—unless he knows something that I don’t) if I had decided whether I wanted to be buried or cremated as he intends. I don’t relish the thought of cremation any better than being buried six feet under, so I told him I wasn’t going to make any decision. He could make that decision for me after I was dead. Now that I’ve spent this time reflecting and writing this, however, maybe it wouldn’t be so bad to be buried in a historical churchyard like St. Paul’s. The nearer to the hub of the city, the better. I don’t expect I’ll be up to protesting regardless of what he decides. But I want everyone who walks by by grave to note a similar inscription as this one that I’ve seen in several cemeteries around the U.S.–to remind them they are not immune. And should there be any way at all possible to cross that great divide between those two worlds–living and dead–and should I sense that whoever is walking by is the least bit frightened, don’t be surprised if I jump out and say BOO! This entry was posted in Musings, Personal by Alice. Bookmark the permalink. And have you thought of an epitaph for that tombstone? There was a time when photographs were popular. That was interesting to me, to see what they looked like. Touching AND interesting! Love it. Thanks so much. You should be careful how you encourage me; no telling what I’m liable to write next. I walked through St. Paul’s, but never really looked at the tombstones. I’ll go back one day, in spring. I’ve given lots of thought to where I’d like to be buried, but I realize I don’t have much choice. My daughter will have to make the decision, now that I’ve been uprooted from Chicago. Wherever she chooses, I’d like to be buried under a tree. Yes, a tree would be nice, but not a tree with an invasive root system. I find cemeteries interesting, too. I belong to the oldest Catholic parish in northeast Ohio and its lovely cemetery is three blocks from my home. It makes a nice and interesting walk. I probably should look into burial there but I hope it’s a while before I need it. Then again, there are days when I wonder why I’m still here or why I would want to be. I think there are days, Kay, when we all feel like that. When that happens, turn the news off. Go to the library and check out the old Harold Lloyd movies–or Laurel and Hardy–and take them home to watch. Much better than the jacka***s in Washington. Now that entry had depth. I too love cemeteries. At Ft. Rosecrans, there’s a wonderful plinth to the sailors who died on the USS Bennington when it blew up in the harbor. You would enjoy our Mt. Hope too, the city cemetery. The older parts are fascinating. I’m amazed at how many respondents like cemeteries! Maybe I was wrong in my assessment. My family reacts a bit weirdly to my cemetery interests. As for Ft. Rosecrans, I figure the prettier the place is, the more company you’ll have. Next time I’m in San Diego I’d like to check those places out. Hope you’re around so you can come along. I love visitng cemeteries and reading the inscriptions. Once when I was heavily into genealogy, I drove a 4000-mile trip visiting 9 cemeteries where my relatives were buried. My paternal grandparents are buried outside Marshall, Arkansas, and have handcarved gravestones, crude but legible. I plan to be cremated and my ashes spread in the mountains around Ghost Ranch in New Mexico. If my wishes are not carried out, I will come back and haunt “somebody”. Oh then maybe I would visit you there. Ghost Ranch is one my favorite places in the southwest. I keep thinking about finding some reason to go there, but I don’t want you to settle there just yet. Alice, In this neck of the woods we need one Doctor to certify death for burial and two for cremation. It is also becoming fashionable to bury ashes, although the plots set aside for them are unmarked on site and reference kept in a book – no headstones. Well it would be a tragedy if the first doctor was wrong, wouldn’t it? Yes, maybe even three would be wise. When I was in high school in a summer writing program we visited a very old civil war era cemetery and made grave rubbings of some of the tombstones. We recorded names and dates in our journals then brought all of this back to the classroom where we began researching and writing both creative nonfiction and fiction stories about our “characters”. Indeed these folks attained a little bit of immortality. I’ve never made engravings, but it sounds like a nice thing to do. And often I, too, make up my own story around a grave. I discovered one under a tree in a paved parking area in Simla (India). The inscription read: Here lies Cooma, beloved companion of Lady So and So. For years I’ve wondered who Cooma was. Those I’ve shared the story with have guessed it was most probably a pet, perhaps a dog. But I’ve written my own story around it, and–well, it’s a different conclusion I won’t go into here. But cemeteries are wonderful places to provide not just story ideas, but character’s names. I used to go to the obituary pages to find those. Thanks for commenting.